A new prototype of the LG G6 shows off a few of the features we expect to see on the new flagship phone when it launches at MWC 2017 later this month. The prototype shows the G6 will come with a smaller bezel around the phone, a 5.7-inch display in the middle and chamfered edges around the sides. You can also see a plastic back to the phone - but that’s unlikely to be the final material the company chooses and considering we've previously seen photos of the phone with a metal back we're pretty certain LG will opt for that. The leak also confirms a dual-camera setup on the back of the phone with a fingerprint sensor just below, like on the LG G5. There's also confirmation the G6 will come with USB-C to charge the phone, but it looks like the battery will not be removable this time. 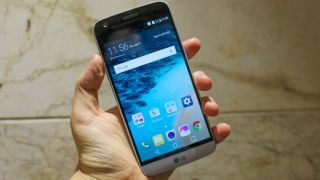 That is sure to disappoint some LG phone lovers, especially considering LG is one of the last flagship manufacturers to champion a removable battery. There’s also a single speaker at the bottom of the phone and the leaker of these photos claims there’s a headphone jack on the top, but it's not pictured. Take these photos from Droid Life with a big pinch of salt as there’s no way to confirm these are the LG G6 prototype, but everything matches up with previous leaks we’ve seen from other sources. Nothing will be confirmed until we see the full LG G6 announcement at MWC 2017 though, which will take place on February 26 and we’ll be there to give you the full lowdown on LG’s next flagship phone.